The Lowe Art Museum is dipping its paintbrush into a different can of paint – students looking to pursue careers in medicine can now learn bedside manner from a series of workshops held on campus. 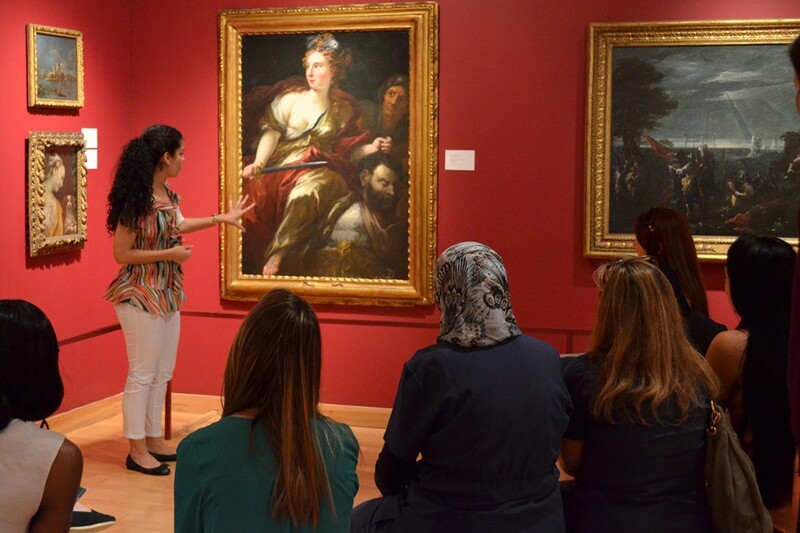 Hope Torrents, school program coordinator at the Lowe Art Museum, created a series of workshops entitled, “The Fine Art of Healthcare,” which invites small groups of graduate healthcare students to the museum to examine works of art. In addition to having created the workshops, she also leads them because she is familiar with all of the pieces on display at the museum. Participants of these workshops are asked to slow their thinking, using techniques called Visual Thinking Strategies (VTS). According to Torrents, the process of observing and listening to others’ ideas about the art translates to practicing medicine. The purpose of these workshops is to improve participants’ bedside manner, through enhancing their critical thinking skills and methods of expression. Todd Ambrosia, associate dean in the School of Nursing and Health Studies, believes the workshops have been a valuable “out of box” learning experience for his advanced practice nursing students. “The student’s ability to develop critical analysis through visual thinking strategies has broadened their perspective of approaching patients and health problems, allowing them to take a multi-faceted approach to diagnosis and management,” he said. Sherill Hayes, chair of the physical therapy department, agrees with Ambrosia. The workshops complement students’ medical education, teaching important skills like collaboration needed in a healthcare environment. For aspiring doctors, the Fine Art of Healthcare emphasizes that doctoring is not just about science. Gauri Agarwal, assistant regional dean of medical curriculum at the Miller School of Medicine, incorporated the Fine Art workshops to introduce the medical humanities to Miller students. “They aren’t just continuing a series of classes that leads to a degree, but entering a profession that is thousands of years old,” Agarwal tells first-year students. Katya Aribindi, a first-year medical student, felt that Fine Art of Healthcare workshops helped improve her interactions with patients. According to Agarwal, listening and careful observation are the best measures of good doctoring. “Knowledge is only one metric – the best physicians are those that quietly observe, patiently listen, hear the individuality and perspective of each patient, and are able to effectively communicate,” she said.